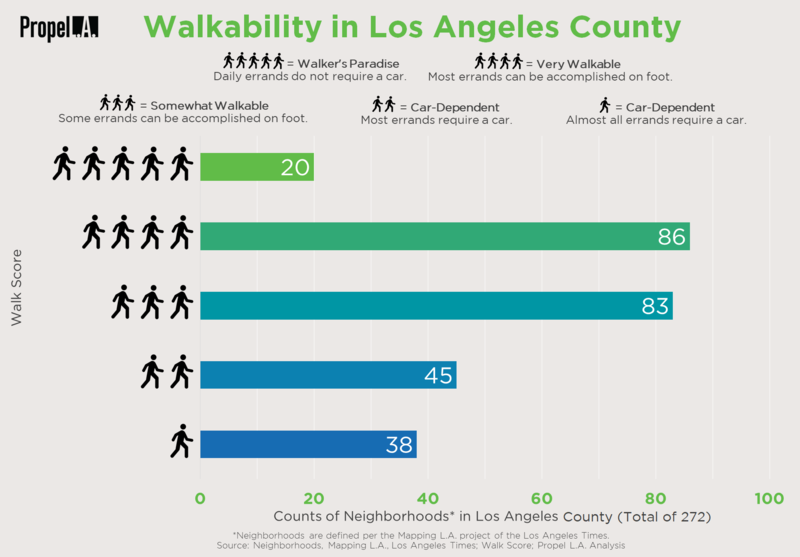 Walkability in Los Angeles County | Propel L.A. There is a positive correlation between livable and walkable communities. Simply put, livability measures how suitable an area is for living while walkability measures how friendly an area is for walking. The correlation comes at no surprise as a walkable neighborhood offers benefits to our health, the environment, our finances, and our communities. Learn more about the benefits here. Summary: While most neighborhoods in Los Angeles County are classified as very walkable (i.e. most errands can be accomplished on foot), there is considerable room for improvement as more than a quarter of the neighborhoods are car-dependent. Methodology: Propel L.A. Analysis identified the 272 neighborhoods per Los Angeles Times, Mapping L.A.
Next, Propel L.A. Analysis retrieved the Walk Score of each neighborhood. The most recent data was retrieved on September 4, 2017. Then, we calculated the Walk Score average of each respective region. Finally, we categorized each region per the Walk Score Methodology. 20 neighborhoods in Los Angeles County are considered a walking paradise. 86 neighborhoods are very walkable. 83 neighborhoods are somewhat walkable. 45 neighborhoods are car-dependent, i.e. most errands require a car. Another 38 neighborhoods are also car-dependent but to a more severe degree. Specifically, almost all errands require a car.